Whiplash is a severe neck injury that occurs when the head and neck are forcefully extended beyond their range of motion. This forceful motion strains the neck muscles, and sprains the ligaments and tendons. The vertebrae can be completely thrown out of alignment. These injuries cause significant pain and impairment of the neck. Many people experience symptoms such as, severe neck stiffness, headaches, migraines and debilitating loss of range of motion. When seeking whiplash treatment and chiropractic care in Toms River, New Jersey, we invite you to our natural healing center. Maximum Wellness Rehabilitation, LLC in Toms River uses natural care to align your body for healing. Our Toms River chiropractor, Dr. Jeffrey Gurrere and the professionals at Maximum Wellness Rehabilitation, LLC believe that your body will restore itself to health when it is placed in alignment. Our chiropractor believes he is a facilitator for your health. He will work to position your body in the best way for fast and efficient healing. 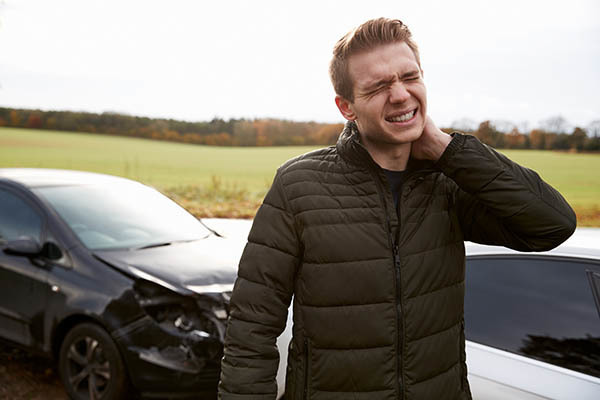 If you have been involved in a car accident, let Dr. Gurrere examine you to determine if you are suffering from whiplash symptoms or other injuries. Pain from auto accident injuries may not occur right away. We encourage you to seek an evaluation with our Toms River chiropractor immediately following an auto accident. Neck pain and Stiffness - from overstretched muscles, tendons or vertebrae that have slipped out of place and are pressing on nerves. If a disc between the vertebrae has been injured, you may also experience neck pain. Worsening of pain with neck movement and resulting in loss of range of motion. Headaches - Most often starting at the base of the skull. If the nerve signals are interrupted or circulation has decreased due to the misalignment, you may experience headaches. Back pain - the discomfort may extend in your upper back depending on how far your head was thrown forward and backward. These muscles may be stretched or strained, and require chiropractic care. Fatigue and Dizziness - When your nervous system has been interrupted, you may be feeling dizzy, tired or irritable. Dr. Gurrere and the health team at Maximum Wellness Rehabilitation, LLC in Toms River, provide effective chiropractic care for whiplash injuries, as a result of auto accidents or personal injuries. Dr. Gurrere uses chiropractic techniques to manipulate your neck into a healthy alignment. If a vertebra has slipped out of position during the accident, our chiropractor gently slides the vertebrae into a pain-free position. This improves your nerve signal flow and circulation to your head to minimize pain and other symptoms. We also use corrective exercises to establish balance and strength in your neck and upper back, This process will also improve the range of motion. Our health professionals will educate you on daily lifestyle changes to eliminate your pain and improve your healing. For effective whiplash treatment and chiropractic care, please schedule your appointment today with the friendly staff at Maximum Wellness Rehabilitation, LLC. Call us at 732-328-9917.